If you have an empty loft space above your head, then nothing seems better than transforming it into a sleeper’s paradise. But where to start? 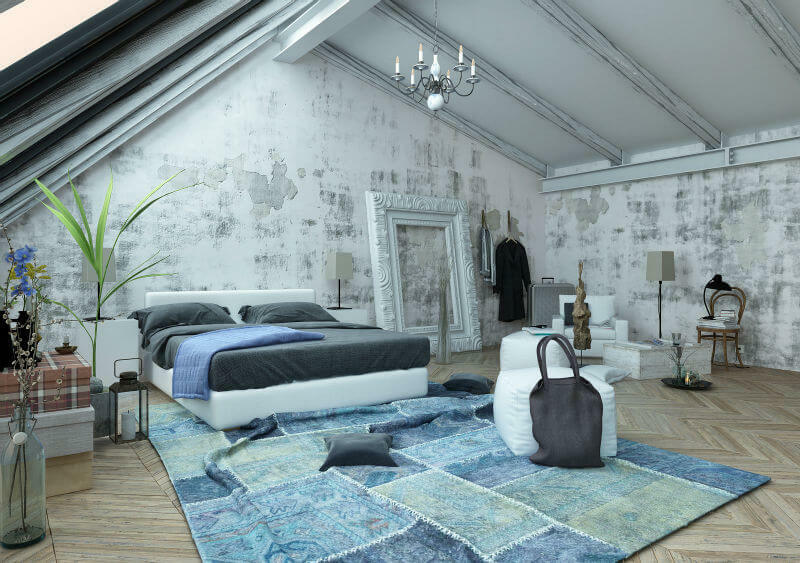 We scoured the internet for the most stunning luxury loft bedroom inspiration we could find – and you’re going to love what we found. As you’ll have guessed, our favourite part of this luxury loft bedroom is the ceiling pillars. They add such character to the room, and this period feature combined with the modern decor is a fantastic twist. The wall curtains in this loft bedroom are a great idea. 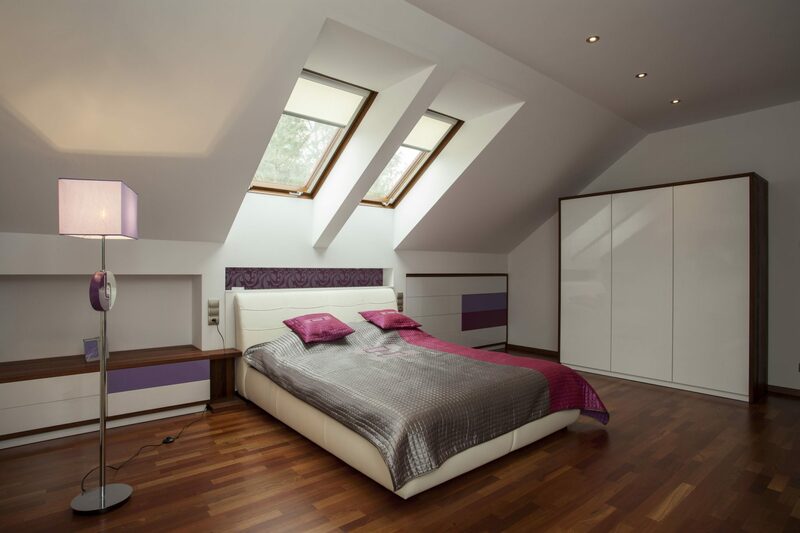 Create confined space and privacy with some floor to ceiling curtains in your own loft conversion. 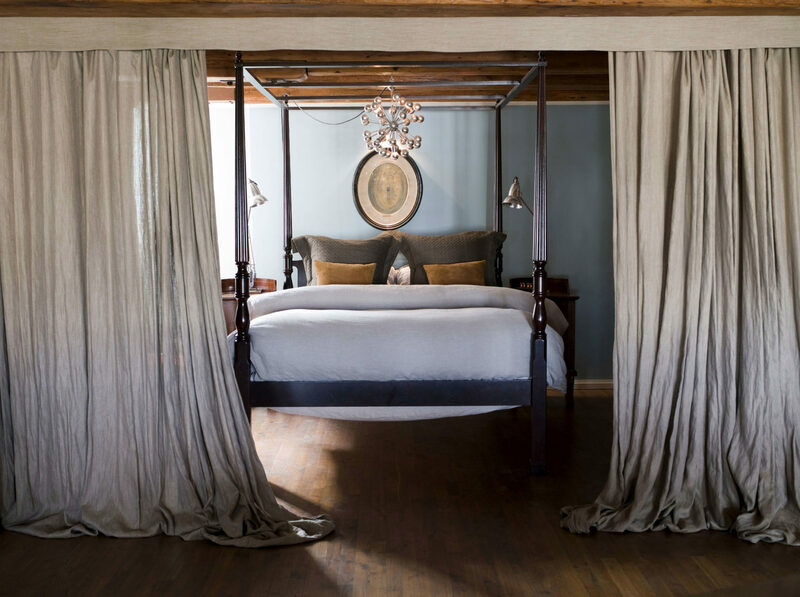 A 4 poster bed always adds a touch of elegance to a room, and we’re in love with the light fixture hanging above the bed. 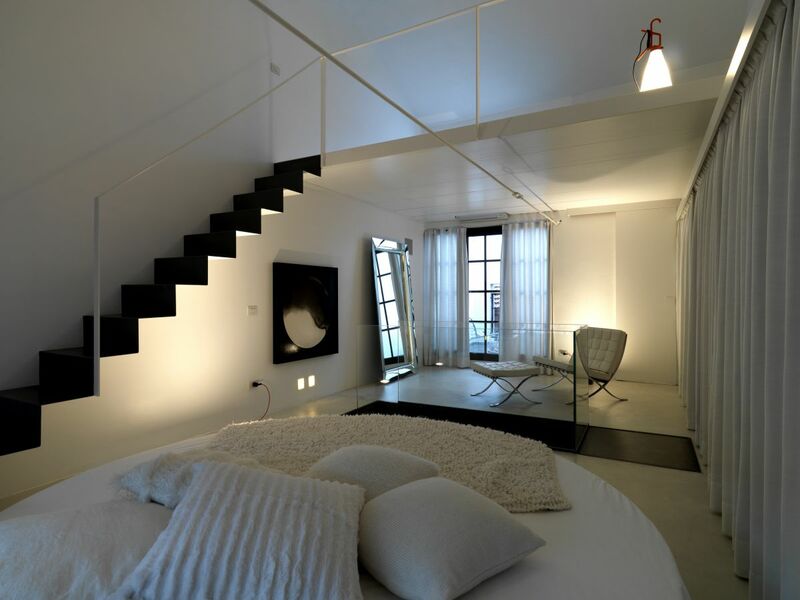 The colour scheme of this loft bedroom is fantastic. The interior colours of muted green combined with the homeliness of the white wood painted ceiling add a beautiful shabby chic aesthetic to this home. The vintage style bed sheets and fluffy carpet make it even more cosy. The main colour in this loft bedroom is white as you can see, but we’re really into the popping pinks and purples that have been added into this colour scheme. Key features of the room include laminated flooring, large ceiling windows, and our favourite aspect – the floor lamp. 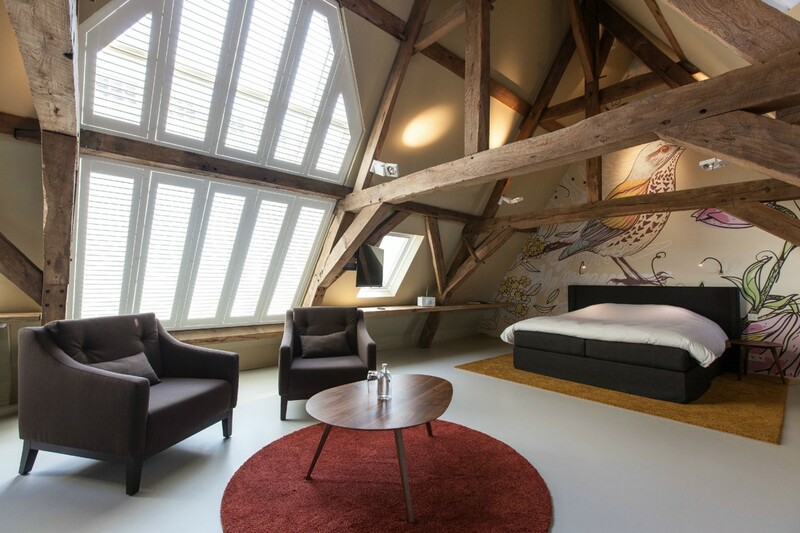 Now this luxury loft bedroom is nothing short of remarkable. 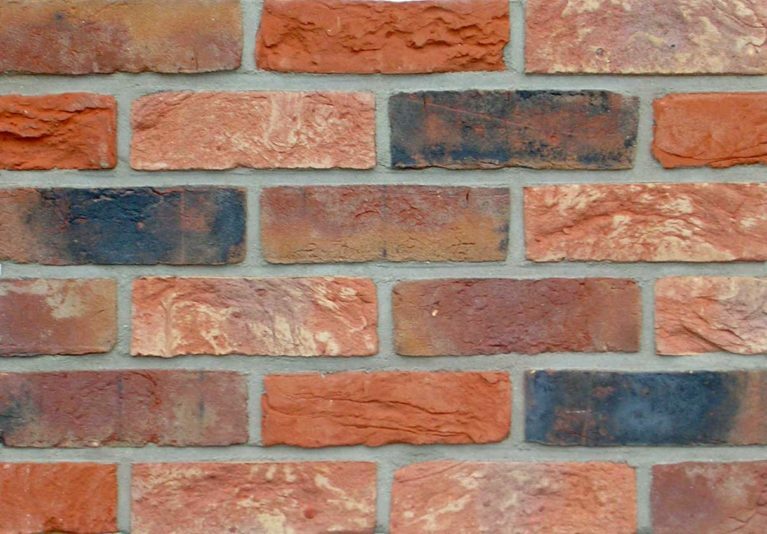 Have you ever considered an exposed brick wall for the interior of your loft conversion? When done correctly, it gives an expensive, open plan feel to a loft conversion and we’re in love. Not to mention the room separating headboard and wall hanging that gives the room a countryside edge. We’ve slipped this in here because it’s simply so unusual. Check out the vast amount of space in this conversion. The pillars that line the wall are fantastic, and the ceiling lights add stunning ambience to the room. But as you can see, the most interesting feature is the bed, encased entirely with glass. We have no idea what it’s for, but we love it. 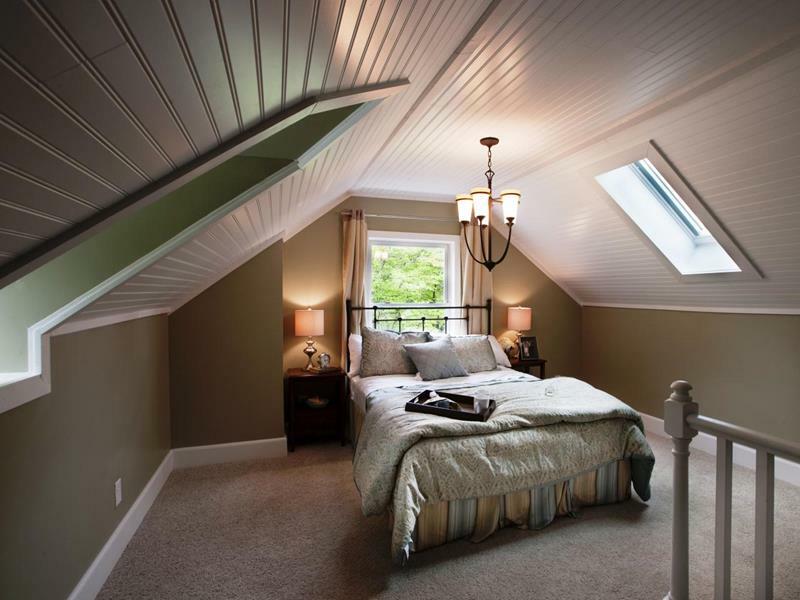 This loft bedroom we added to the list because the functionality of this room is simply unreal. 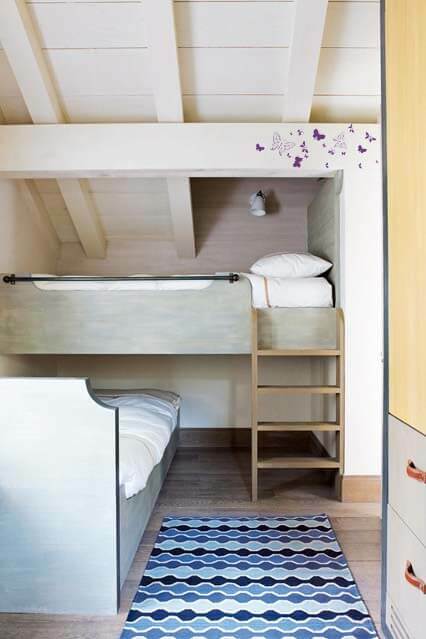 Incorporating bunk beds with effortless storage, this loft bedroom shows you don’t need a lot of room to have luxury. The material and construction of this bed frame is what makes this room. 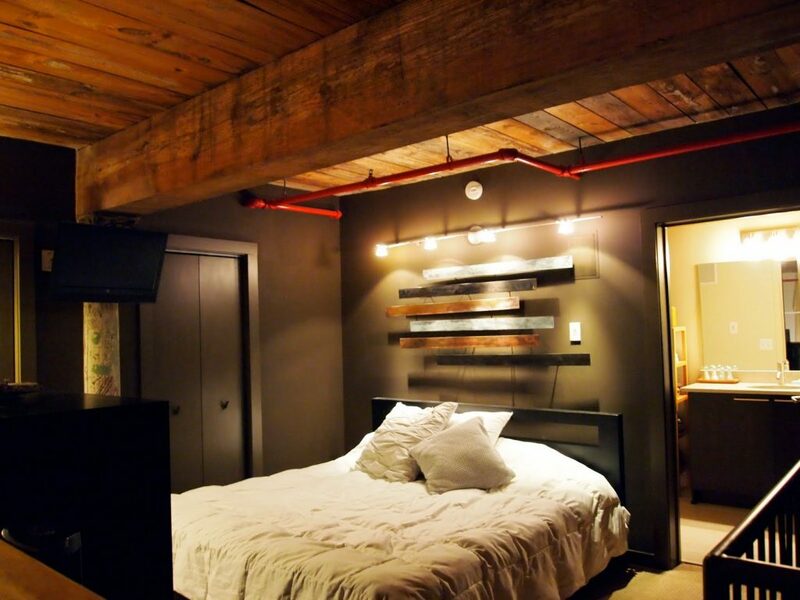 We love the bright red exposed pipes in this luxury loft bedroom. The ambient lighting reflects off the dark wood used for the ceiling beautifully and the dark coloured paint absorbs just enough light. We find the wood placed on the wall above the bed really interesting – and relatively inexpensive to recreate. This is effortless chic. Now what don’t we love about this one? The large blue patchwork rug, the gigantic frame in the back there, the chandelier – extravagant or what? Not to mention the massive feature vase on the left there. This colour scheme is well thought it, and it’s completely littered with interesting objects. We love the unpainted walls, it adds an element of grittiness to the otherwise perfect decoration which is a great contrast. 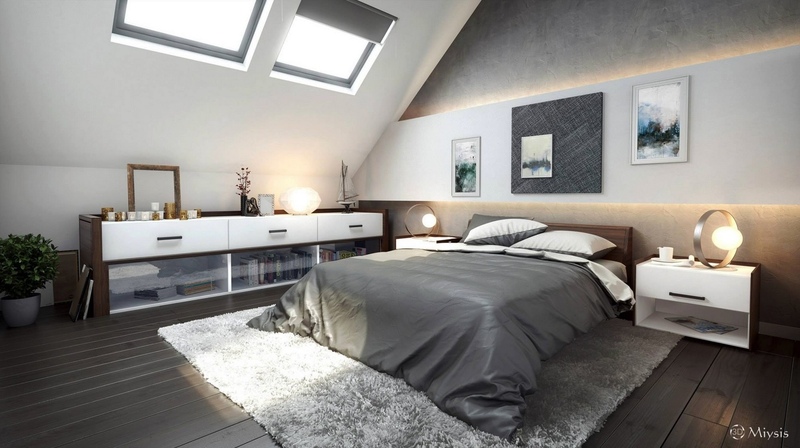 It’s the use of geometry which makes this luxury loft bedroom so stunning. Check out those modern circular lamps on either side of the bed. Square windows and layered up canvases on the wall add interesting elements for the eye here. But above all – can you imagine getting up in the morning and sinking your feet into that rug? It’s hard to pull off a circular bed, that we know. But this loft conversion does it right. Perhaps it’s the architecture and the way the stairs lead up to another story with its understated hand rail, or maybe it’s just the use of pale colours. Floor to ceiling windows with full length curtains leading out onto a balcony have us dreaming of the summer months. And check out the little lights on the bottom of the wall on the left – an unusual but beautiful design feature. Where do we start with this? First let’s mention the ceiling that’s made up of beautiful pine wood. Very aesthetically pleasing. Next let’s note the utilisation of the wall on the right to make it entirely optimised for storage. The materials of the shelves make it look modern and understated – but you know it’s practical. The brick feature wall on the left contrasts nicely with the ceiling. But out favourite part? – the BATH! Imagine having a bath literally 2 feat from your bed, can you imagine a nicer way to finish the day?